Local folk music heroes, Our Shotgun Wedding (aka Dylan McMullin & Lauren Jewell) are set to perform their magic Thursday May 2nd. It’ll be a sweet evening! Advance tickets are $20 and are available NOW at the restaurant OR call 519-270-8570 with MC or VISA and we will have them put aside..
LIMITED SEATING, please get yours ASAP to avoid disappointment! From Dylan & Lauren: “Come join us for a very special evening at the lovely Bleeding Carrot in downtown Owen Sound. We have a very intimate show prepared, some new songs, plus some big news to share! The Bleeding Carrot is very excited to present a recently formed duo of beautiful musicians. These two will make your ears very happy! Folk, funk, sass and fun!!! This music is about being yourself and feeling good. If you’re struggling with this, we’re happy to shoop your shoes. Join us for a wacky/wonderful and intimate evening with The Shoeshoopers - Josi Elder, Rob Elder, Mike Weir & Sylvie Kindree - at one of our fave Owen Sound spots - The Bleeding Carrot. Tickets are $15. Show starts at 7:00. Friday March 2nd 2018. We’re excited to see you there! To learn more, go to The Shoeshopper's Facebook page! The Bleeding Carrot is a busy downtown Owen Sound restaurant. Duties include, but are not, limited to cooking, cleaning, serving, cash, customer service. Experience preferred but will train the right applicant. Strong work ethic a must. Appy in person at 945 - 2nd Avenue, Owen Sound, with resume, or by email through website. Or you can apply through Facebook. 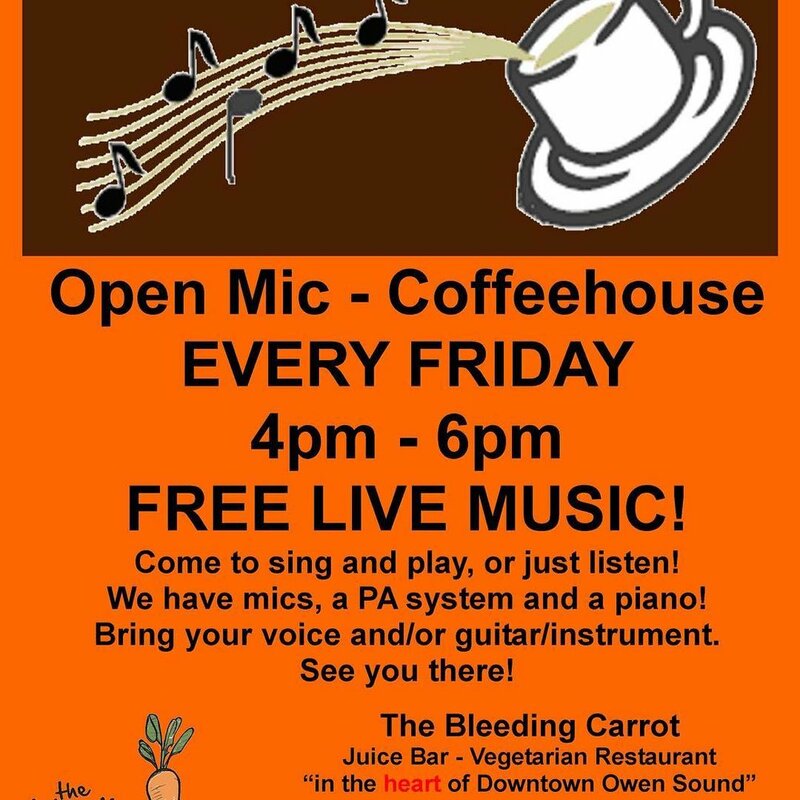 We just wanted to remind all of our customers that every Friday night, from 4pm to 6pm, there is FREE live music at The Bleeding Carrot. This is an open mic format. Anyone and everyone is welcome to participate - you can sing, play or just listen. We have microphones, a P.A. system and a piano. You are free to bring your own guitar or other instrument. Also, while here enjoy our locally roasted, fair-trade, organic coffee that is freshly brewed! We are located at 945 - 2nd Avenue East in the heart of downtown Owen Sound. Our phone number is 519-270-8570.